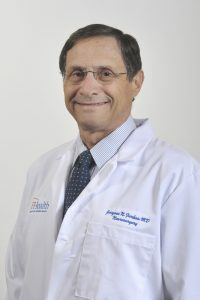 Jacques Farkas, MD, is an associate professor in the Department of Neurosurgery at the University of Florida College of Medicine. Dr. Farkas earned his doctor of medicine degree from Rush Medical College in Chicago. He completed a one-year surgical internship at Northwestern University Medical Center in Chicago, followed by a neurosurgery residency at Loyola University Medical Center, Maywood, Illinois. Dr. Farkas previously worked with the UF Department of Neurosurgery at Orlando Health. Dr. Farkas currently practices at the UF Health Neurosurgery program at Halifax Health and focuses on neurotrauma, neuro-oncology and spinal surgery.